Four students from Sonoma State University's BFA program display their work and selected work of their peers in a group exhibition in the University Library Art Gallery at the Jean and Charles Schulz Information Center located at Sonoma State University. Works included in the exhibition include a sampling of the four disciplines taught at SSU's Art Program: sculpture, photography, works on paper, and painting. 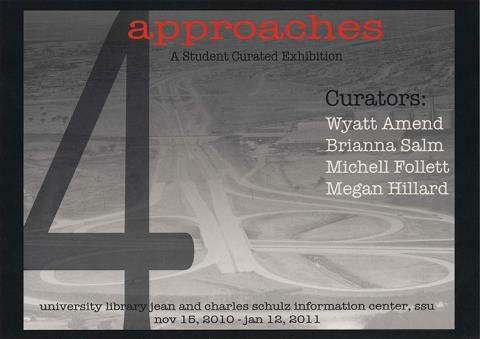 The four primary exhibitors and curators are Wyatt Amend, Brianna Salm, Mitchell Follett, and Megan Hillard.